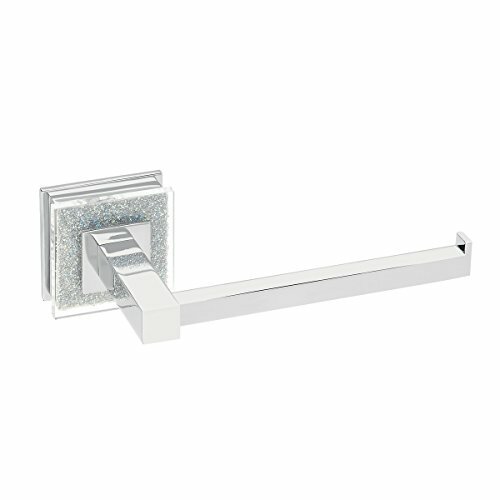 Shiny metal meets Sparkling crystals in this luxurious bathroom accessory from ruvati's Valencia collection. Handcrafted in Spain, this piece is not for the ordinary bathroom. When we set out on this journey we consulted jewelery designers and interior decorators who knew their craft and understood our vision. The result is the Valencia collection; bathroom accessories designed and crafted to bring out the glamor in the most intimate room in your mansion. Valencia will go well with a variety of interior design styles including art Deco, modern, contemporary, oriental, gothic or traditional. Made in Spain, using the highest quality material: solid brass construction, chrome plating and a unique crystal inlay. The complete Valencia collection include (sold separately) matching towel bar, robe hook, toilet paper holder and towel ring. Made in Spain toilet paper holder for the bathroom solid brass construction ensures durability and dependability 6 (WIDTH) by 2 (height) by 3 (depth) chrome finish with a crystal inlay creates a unique luxurious style matching collection available: robe hook, towel bar, towel ring and toilet paper holder (sold separately). mounting hardware included backed by ruvati limited lifetime warranty on finish and construction. If you have any questions about this product by Ruvati, contact us by completing and submitting the form below. If you are looking for a specif part number, please include it with your message.